Developed with legendary producer, musician, and engineer Tony Visconti, Tverb provides an extremely customizable room reverb with some unique techniques and features. Within this virtual room (modeled on the legendary Meistersaal at Berlin’s Hansa Tonstudios) you can mix three virtual channels: one main mic with subtle ambience and two moveable mics capturing the lush room reverb. Tverb is a reverb unlike any other. Start with a perfect room and configure it to taste by adjusting the standard reverb controls of decay, diffusion and EQ to create the ambience that brings your tracks to life. Now, place a couple of additional microphones anywhere in that room. Move them around until the track sits perfectly in your mix. Set the mics gates to open with the dynamics of the track. Tverb, gives you control all of these parameters and more. And because Tverb is algorithmic, you can do it all in real time (which wouldn’t be possible with a convolution reverb). You can even have your mics dance around the room in real-time. Impossible in real life; a snap in Tverb. With analog-modeled compression on the main channel and gating on the reverb channels, Tverb is a unique tool for audio with wide dynamic range. The inspiration for the plug-in was the setup Visconti used to capture the incredible dynamic range of David Bowie’s vocals while recording Heroes. Tverb builds on Visconti’s technique and opens up undreamed of possibilities. 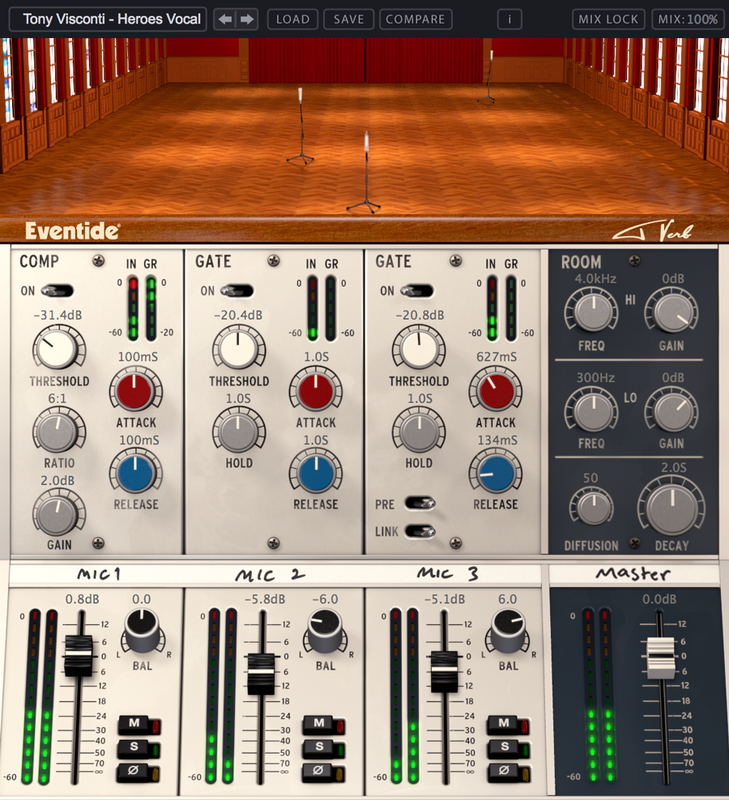 Tverb comes preloaded with artists presets, including some by Tony Visconti. Check out the sound clips below to hear how Tverb works with drums, guitar and synth. In this demo by Reverb.com, they recreate the iconic Psycho score using Tverb for the reverb effects. Get the exclusive Reverb.com Tverb Presets for free! Tverb is an impressive and unique reverb with a surprisingly low CPU footprint...No one could ever match Bowie's performance on "Heroes," but now we can sort out what a drum bus send might have sounded like through the same signal chain – in stereo, without buying a ticket to Berlin. While this reverb plug-in only simulates one room, it does a great job and is surprisingly versatile when compared to similarly priced IR convolution reverbs available on the market today. Tverb's combination of gorgeous reverb, flexible mic positioning and useful dynamics control makes it unique and very special indeed...It's a triumph and Bowie would have been proud. Tverb’s Meistersaal room simulation is full of character, and being able to sculpt its intrinsic nature in specific ways greatly expands this plug-in’s usefulness. While you may think this is just for that vocal sound, it’s not at all...Tverb is great-sounding, easy-to-use reverb meets room tool, with a lot of creative options. Great sounding plugin… based on a great sounding technique… that works really well on lots of sources. Having this kind of slightly more complex hookup readily available (with save-able settings) in one plug-in is a particularly quick and convenient way to add some musical, dynamic reverb processing to various tracks in a mix, as called for, though, of course, it really shines on vocals. I already love it...Tverb is a refreshing new look at the making of a plugin for emulating a production technique instead of trying to emulate a piece of gear and I like it for that. The sound quality of Tverb is awesome and sounds so lush. Tverb offers one of the very best sounding acoustic spaces I’ve ever heard on a plug-in, with a natural and detailed room sound that blends very nicely with the source. Qualitativ ist Tverb ein Paradebeispiel für die hohe Kunst des algorithmischen Halls, die Eventide, nicht zuletzt dank jahrzehntelanger Erfahrung auf diesem Gebiet, perfekt beherrscht. To make a plugin that pays tribute to Mr. DAVID BOWIE and Tony Visconti at the same time shows once again that you have respect for the professionals in the audio industry and is a tribute to one of the biggest legends of the last 50 years who left us 30 years too soon unfortunately...You really deserve to be the best Audio company in the world. I fell in love with it the moment I tried it. Tverb reproduces [Visconti's] technique by supplying algorithms that realistically emulate the microphones, processors, and room he used in the original recording...The result is a stunningly realistic reverberation paired with a huge collection of presets designed for just about any situation.